Let me start with saying I actually was familiar with this story from Wattpad. Even follow the author and have read the "Cell Phone Swap" (original stories name on Wattpad) so going in I knew I would enjoy it. I always enjoy reading Wattpad books that are published to compare the stories see what is there and what is missing. Please note during this review I will be comparing aspects between both Wattpad and the published version with no spoilers. It is very quick esp since a lot of the pages include text boxes instead of words so even thought it is 300 pages it isn't really. I finished actually in one night which I rarely do because of work and family stuff. 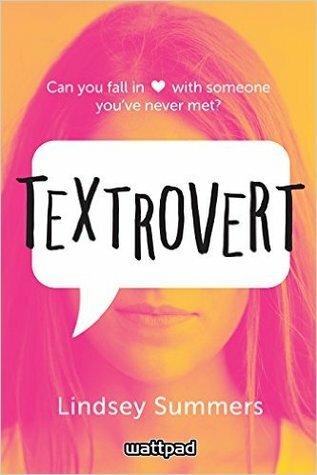 So lets start off with the title Textrovert is an amazing title. So much better then "Cell Phone Swap" not that it isn't a good name but with the cover it fits great and much more of a catch the eye kind of book. Plus Cell Phone Swap kind of tells you more of what the story is about compared to actually wanting to grab the back of the book and read the blurb. So A+ on the change. This story basically takes you on the story of Keeley and Talon who they accidentally swap phones at the fair a night before he leaves for football camp. It is told completely in Keely's POV so you never really know much about Talon other then what he is texting. (There is a story on Wattpad started in his POV https://www.wattpad.com/story/7467918-iamtalon although it is slow updated last update was in December) I really like her character but feel this story might of been a bit better with his perspective as well in the published edition (or at least hopefully the wattpad version is quicker to update before publication) Here you learn Keely is the somewhat awkward sister of her ever popular brother Zach the school quarterback and unbeknownst to her Talon is the rivals school quarterback. They after meeting continue to talk and of course bring on the star crossed lovers romance. It is cute and enjoyable. The biggest dislike I think is because the Wattpad version there were so many great scenes that are missing. I understand having to scale back some but some of the scenes make the story. My favorite was the text from football camp about him not getting it up. (I know this is geared for a little bit younger of an audience but that was the best scene of the story) plus the game night scene. How things happened just did not feel right and sort of rushed. I did not love the characters as much as I did in the version. I think had I not read the Wattpad version it might not of bothered me as much. “Haven't you ever heard curiosity killed the cat? ''Keeley asked as she pulled onto Laura's street.